Posted on December 7, 2015 by academicbookfuture	in Academic Book Week, conference, research and tagged Andrew Prescott, bookfutures, dan franklin, RCA. On the 23rd November 2015 The Royal College of Art hosted a symposium to discuss the Ecologies of Publishing Futures. The symposium asked ‘How do designers engage in new ecologies and what is the future of publishing?’ Academics, designers, storytellers, publishers, and students spoke about this from international perspectives and debated over the book and its lifecycle, as well as the role of writing, designing, and the processes of mediating, distributing, and reading. Prescott spoke about how this work and his time at the British Library made him conscious of the hugely varied material forms of textuality. Historical documents can range from clay tablets to sound files and moving images, and, he argued, digital technology can help convey the wide-ranging nature of historical textuality. Digital technology also allows closer contact between libraries, archives, and museums. According to Prescott the important thing to take away from this is that dialogue with artists and designers is essential in articulating fresh perspectives on engagement with historical material. An example he cited was an art project by Fabio Antinori called Data Flags, which was exhibited at the V&A last year. He used conductive ink, which is often thought of as an analogue art form but can turn paper into circuits. Through other examples Prescott suggested that the textuality of art is always changing and shifting with the times and proved that the boundary between primary object, publication and interpretation is starting to be fundamentally restated. Prescott summed up his talk by ending on a somewhat cynical note: while all the possibilities he mentioned are there, people are bit taking advantage of them. His view is that the scholarly environment for an undergraduate today is less media-rich than it was forty years ago. Textbooks during his time as an undergraduate explored the potential of new printing methods, none of which have been followed through on. Dan Franklin, Digital Publisher at Penguin Random House, had been given a brief to provide a provocation for the event on the state of digital publishing, so what he provided was a ‘where-we-are-now’ overview to provoke discussion and invite debate. He acknowledged the changes digital publishing is making to the publishing industry and talked about it from the perspective of someone who is in the midst of the shifting landscape. Using an analogy of William Golding’s The Inheritors Franklin compared the plot of that novel, the collision of Neanderthal men and women with Homo sapiens, the people who would inherit the earth from them with the current state of the publishing industry. The analogy here being the moment of transition between print and digital, a short and historical moment of co-existence. And Franklin suggests that they can thrive with each other instead of being viewed as competitors. He recognises the urgency and potentially demoralising nature of change, but adds that it can also be exciting, depending on your viewpoint. As a digital publisher at Penguin Random House he motivates his team to explore the bleeding edges of this publishing transformation. During this year Franklin stated he has seen some interesting and willful misinterpretations of what is happening in publishing. The fact of the matter is that 25%+ of publishers’ revenues are coming in via digital and that is not going to reverse. The “takeover” however, has not happened as quickly as people thought it would and Franklin states this is a testament to the formidable power of the printed book. Franklin is adamant that the word processor has not stopped writers continuing and developing the novel form so why should the innovation stop there? Franklin urges publishers to continue to be innovative with change and see what can come from it. Professor Teal Triggs of the RCA stated that by talking about “ecologies” of the publishing industry, we can strive to understand the process of the lifecycle better and whether proposed models are going to be relevant. It’s important to look at the entire lifecycle, not just the editorial or author aspects but the design and distribution as well. Creative people think differently and their design thinking process can be a catalyst for forwar- thinking throughout the whole industry. See twitter hashtag #bookfutures for more information about the symposium and other related events. Posted on August 21, 2015 by academicbookfuture	in academic books, conference, digital, Open Access and tagged 11th International Milton Symposium, Milton. The Project was recently invited to speak at the Eleventh International Milton Symposium (University of Exeter, 20-24 July) by Professor Thomas Corns. Prof. Corns is a member of the Project’s Advisory Board as well an eminent Milton scholar – he was recently awarded a British Academy Fellowship in recognition of his contribution to Milton studies – and is therefore ideally situated to channel (and provoke!) conversation between the Project and this group of specialist researchers. This post is a summary of the issues, thoughts, concerns, and ideas that arose during this session. ‘The monograph is something that every academic wants to write, few academics want to read, and no academic wants to buy’, as a distinguished commissioning editor once provocatively remarked. Prof. Corns then put into play the view that the monograph constitutes the ‘gold standard’ for arts and humanities scholars, a view that certainly shaped institutional thinking across the sector in preparation for the recent REF, but he asked: if very few people want to read these books, and even fewer are buying them – what is the rationale behind this status? Why is the monograph still supreme? The issue of ‘monograph vs journal article’ has cropped up fairly regularly in Project conversations with other stakeholder groups and communities, from a range of angles – including the idea of ‘thesis-by-articles’ as an alternative to the 80-100,000 word monograph that has hitherto been the standard model. There have been a variety of responses to this proposal, ranging from enthusiastic to the horrified, so this was a pertinent point. I couldn’t help but think of huge supermarkets here, where small organic groceries have sprung up in response. Or instances where people start to grow vegetables themselves instead. Will people publish themselves in the future? Some attendees wondered about teaching in a digital world – how do students use books, create their own content, and what other content do they use such as the excellent Milton Reading Room hosted by Dartmouth College (http://www.dartmouth.edu/~milton/reading_room/contents/text.shtml). How is teaching going to be affected by these new books, materials, and new contexts? Do these points resonate in your discipline? Are there are others for you and your colleagues? Do you vehemently disagree with any of the above? Get in touch using the comments below! Note: The views given above are not necessarily those of the Project or its partners, or Milton scholars en masse! The Project has attempted, insofar as possible, to accurately capture the views and opinions expressed at this event. All opinions and comments have been anonymised. Posted on July 31, 2015 by academicbookfuture	in conference and tagged books, Christoph Blasi, Claire Squires, Nick Canty, SHARP, Siobhan McMenemy. 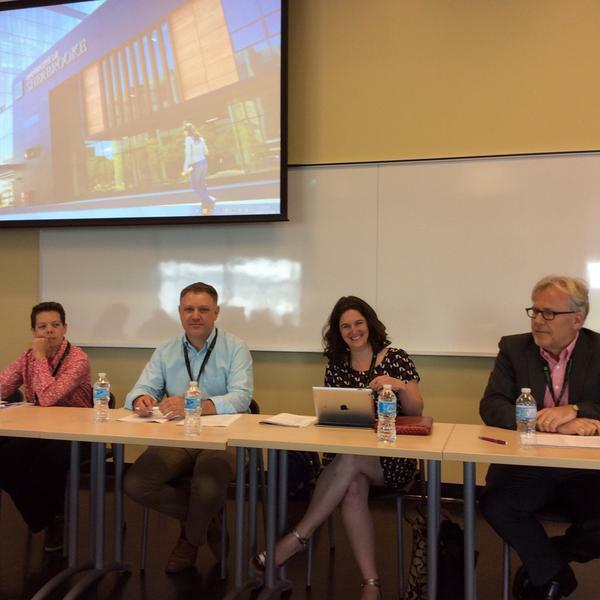 SHARP 2015 was a bilingual conference hosted by the Groupe de recherches et d’études sur le livre au Québec, the University of Sherbrooke, McGill University and the Bibliothèque et Archives nationales du Québec. The conference included lectures, keynote addresses, a digital projects showcase, roundtables, lightning papers presented by doctoral students, a poster exhibition featuring the work of master’s students as well as workshops. Over 350 people attended the conference, which was held in three locations over four days. Nick Canty writes this conference report. The theme of the conference – Generations and Regenerations of the Book – was highly appropriate to discuss in a round table the future of the academic book. The round table consisted of Nick Canty, UCL, Christoph Blasi, Gutenberg University Mainz, Claire Squires, Stirling University and Siobhan McMenemy, University of Toronto Press. 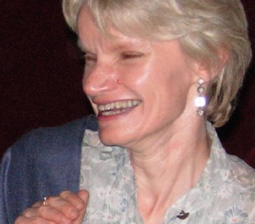 The event was chaired by Alexis Weedon from the University of Bedfordshire. Each participant briefly addressed the topic. Nick Canty outlined the AHRC Academic Book of the Future project, Claire Squires asked how SHARP could consider the question and where the topic sits in the context of Book History before addressing the definitions – what is a book, what should we consider an academic book and how what timeframe should we consider for the future. Siobhan McMenemy set out the publisher perspective with a focus on costs, monograph print runs and commercial imperatives with a sobering thought that a monograph in Canada costs C$ 32,000 to produce. Christoph Blasi saw the topic from two perspectives; bottom up driven by technological advances and the ability for content to be manipulated and distributed in radical grass-roots ways, and top down driven by institutional requirements – such as the UK REF. While we cannot know what the future holds there are some reformist top-down approaches in universities. The debate was then opened up to the floor and started with a discussion around predatory publishers of the sort found on Beale’s List which try to hoodwink naïve researchers wanting to get their work published. This sort of publishing activity however should be seen as a symptom of the environment and not the cause. There was however a recognition that there needed to be a value shift and a questioning of whether the monograph was appropriate for all disciplines and in particular emerging disciplines – does the monograph give more authority to these as the discipline builds its infrastructure and seeks academic recognition? There are questions here around legitimacy and innovation which have yet to be resolved. Early career researchers may consider publishing a monograph from their PhD but they may achieve more visibility by publishing papers in a journal instead. The question of funding and money was addressed which was seen as a significant issue for Arts & Humanities disciplines where the cost of Open Access books is prohibitive. Publishers are certainly experimenting with new business models such as the University of California Press community business model which a member of the audience saw as a possible solution here although this initiative is currently funded by the Mellon Foundation only for a limited period. A further suggestion was that university presses might alleviate competition by honing their publishing lists so they (the publishers) are unique. This route is being actively pursued by the Association of Spanish University Presses which is encouraging its members to specialise by discipline. The University of Toronto Press expect Open Access models to reduce profits by 50%. The functionality of print and digital books was debated at some length with some members of the audience disliking Ebooks which were seen as less easy to navigate than paper despite innovations from publishers allowing users to annotate the content. This led on to a discussion around whether we are witnessing the slow demise of the library as a space for learning and whether students and universities needed a physical space any longer. The University of Toronto built a new library but has changed the name to a student learning space and provides limited access to print books. Ebooks should enable a convergence of content and pedagogy through virtual learning environments although this presents challenges for publishers who risk their business models changing from institutional sales to libraries to selling to the individual student. The round table concluded with an acknowledgement that the future of the academic book will be shaped by discipline and technology but we are likely to exist in a hybrid print and digital world for the foreseeable future, and at least until there is an institutional recognition of content taking novel and innovative forms. While the round table finished, the debate continues and follow-up activities will include blog posts for the Academic book of the Future website and a post by forum chair Alexis Weedon. The discussion will be taken forward through numerous and varied activities as part of the AHRC project and specifically during Academic Book Week, 9-16 November 2015. Academic Book Week aims to encourage discussion around the future of the academic book while looking at how scholarly work in the arts and humanities will be produced and read in coming years. The week will see academic books discussed, showcased and even written across a number of events – notably a launch event with academic publishers at Stationers Hall in London on Monday 9 November and the Opening Up the Book Debate with Kathryn Sutherland, University of Oxford and Marilyn Deegan, King’s College London, while the British Library will host an academic book showcase ceremony and Palgrave Macmillan put the writing of an academic book into practice with a faster publishing model aiming to publish a book in a month. Through The Academic Book of the Future project the opinions of all those who read, write, sell, produce and use academic books can be heard and the topic will be discussed at the next SHARP conference in Paris in 2016, an issue Claire Squires was keen to see addressed and saw as an issue central to the mission of SHARP. 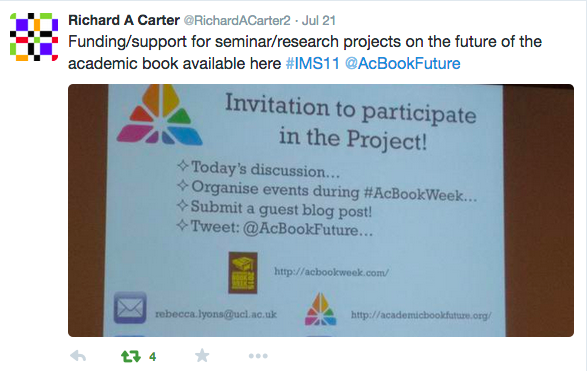 Posted on July 1, 2015 by academicbookfuture	in conference, publishing and tagged books, digital. Project Team member Nick Canty (UCL) recently spoke at the two-day By the Book conference in Florence. This post is a brief report on the conference and some of the major themes and issues that emerged. The overarching theme for this two-day conference was ‘Books and reading in an age of media overload’ – a big subject. 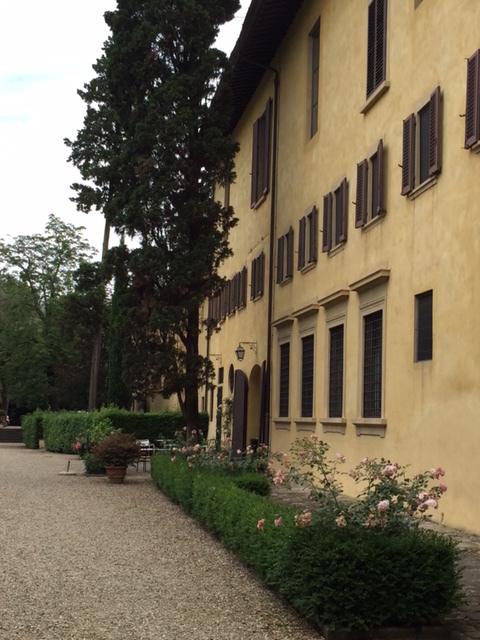 We were fortunate the event was held in the rarefied location of the Villa Finaly outside Florence, which since 1953 has been owned by the 13 institutions which comprise the universities of Paris – this place is no stranger to big ideas. The conference brought together scholars from the field of publishing studies to examine key issues around the digital transformation of the book, as well as to discuss the developing field of publishing studies. In total, 14 countries were represented, an increase on last year when the conference was first held. The conference started with the evolution and transformation of reading with three presentations looking at cross-media storytelling and screen reading practices which suggested that the pdf has established itself as an influential format with its own sets of references and screen reading habits and will be likely to influence future devices and reading habits. This, it was argued, is because we see the connection to paper from the pdf. The final session was an analysis of student book-buying practices, which suggested students take little notice of reading lists and recommendations from academics, at least in Nanking, Pisa and Zadar. Of the three countries surveyed Chinese students were far more likely to be reading on smartphones. Staying with the book, a later session considered the book as a dissemination machine with talks on design in digital textbooks, ebook trends in Poland and software as amplified content raising the question about whether software can be considered publishing. As with all large questions this defied any easy answers. The session on scholarly publishing had three perspectives – one looking at the use of ebooks in Swedish academic libraries; a talk by Sally Hughes from Oxford Brookes University on how the Met Museum in New York had repurposed their back catalogue to create a free online resource; and a talk from Elsevier on value and exchange in scholarly publishing interactions, referencing John Thompson’s arguments around capital and value and supply chains in publishing. Two papers specifically addressed editing. Susan Greenberg from Roehampton University talked about the poetics of editing with her definition of editing as a decision-making process – selecting, shaping and linking content – delivering the meaning of a work to its audience, and the art of seeing text as if it is not yet finished. As was pointed out, given the conference setting, this is rather like seeing the statue of David from a block of marble. Dr Greenberg argued that there were many studies which portrayed editors in a negative light, particularly in the 1940s concept as the gatekeeper, a concept now challenged as new media can democratise the field. Katherine Reeve from Bath Spa University made a powerful case for using editors better in publishing companies as they often offer the best ideas to promote and develop content – but they need to be given the opportunity to develop new skills. This was reinforced by Frania Hall from London College of Communication who discussed a recent survey with publishers in the UK which indicated that the editorial function is getting the least attention when looking at digital change. I gave a paper on book culture, considering books in social spaces – particularly on YouTube – and how vloggers are being picked up by publishers with varying degrees of success. UCL’s Dr Melanie Ramdarshan Bold’s analysis of authors on WattPad asserted we are far from witnessing the death of the author and as pointed out by Professor Alexis Weedon from the University of Bedfordshire there is space to examine author brands as part of celebrity studies. As with every conference on publishing, the issue of definitions reared its head. Zoran Velagic talked about the problems of definitions and how traditional methods to understand publishing (functional or linear chains as articulated by John Thompson) are redundant in the digital era. He suggested instead four new approaches: media-oriented – looking at what a book does to society; an author perspective – particularly because of the increase in self-publishing; a content view, which considers network participation and asks how capital can be maximised from content; and lastly a producer orientated approach, which looks at the author and content. Claudio Piers Franco from the University of Bedfordshire introduced us to the concept of the ‘gamebook’ and to what extent different media formats have what might be considered ‘bookness’ in them, and considered the book as a social space, influenced by bloggers coming together in a shared space. One interesting point to note is that despite various technological developments, the term ‘book’ persists. Next year’s By the Book conference theme is audience development.